"Aquarium Park" redirects here. For the DS version of the stage, see Aquarium Park (DS). Aquarium Park is the fifth stage of Sonic Colours. 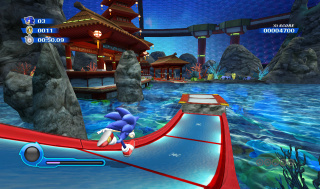 As the name implies, it is a massive water park in Dr. Eggman's Amazing Interstellar Amusement Park with an oriental theme, hearkening back to the Dragon Road stage from Sonic Unleashed. Sonic runs from the glowing eastern vista on the surface into a tunnel that leads to the underwater portion of the stage, which he can access using the Yellow Drill Color Power. Crabmeats and samurai-themed Egg Pawns make their appearance here, as well as a giant robot that chases Sonic through the tunnel. The stage also features the Blue Wisp, which allows Sonic to turn blue rings into platforms and vice-versa. This stage also marks the 2nd 3D Sonic title after Sonic Adventure to allow water exploration for Sonic without killing you upon breaking the water's surface. Sonic begins flying down a tube, heading down to pipes that lead to one of the main pieces of the aquarium playground, which relates exactly to a fish aquarium. Racing inside a building, he encounters a group of Eggman's mech, who look like they're ready for a samurai show. After the very first checkpoint, the camera angle is set in 2D and areas of water appear, similar to the 2D-games of Sonic the Hedgehog. The only wisp, perfect for breathing underwater, is the yellow Drill wisp. Roaming around, Sonic eventuatlly heads into another tube that leads to the next aquarium dome, where the goal ring is, located underwater with a group of rare, brightly-colored jellyfish. He starts racing around the "bridge of death" to a group of springs and the camera automatically changes to 2D. The main challenge is the Red Star Rings if you attempt to collect all before you reach the goal. Just keep Sonic on the blue blocks and spinning platforms and you'll be fine. 1* Use cube and go down. 2* Use cube and go under the platform with 3 robots. 3* (will update later) 4* (will update later) 5* Use cube and travel above the Goal Ring. Sonic stands at a point, you may remember from Act 1. Take Sonic underwater and use the Orange Wisp to blast off, nearly, to the roof of the dome. As you fly downward, avoiding the spike-balls, he should continue through a loop and step on a switch that drops a platform and allows you to continue. If you do go underwater, you have to use Rocket again to get out and collect the red rings in a narrow, little trap. After the first checkpoint, you should be able to use Frenzy (unless you haven't completed the first act of Asteroid Coaster) and destroy the black crates and get the Rings and the red ring. After that, if you have any energy from the White Wisp to boost, use the remaining energy to destroy the robots, "guarding the Goal Ring." If you haven't noticed it, Act 4 begins on the edge of where the Act 1 Goal Ring was located. After you hit the spring to next area of Act 4, (for some reason) an Eggman mecha chases you for a super-short about of time. Hitting red trisprings and pushing the crates closer to the surface, the very first checkpoint marker should be reached. This is the main area, where the screen changes from 3D to 2D and the majority of the remaining area is underground. After traveling around the secret passages and finding a couple of red rings (confusing to find all on this area), you should be chased by a similar robot downwards, into the final dome. Evenutatly, from the speed of falling down, you hit springs, while the robot crashes into rocks. Rescue the wisps and the level is down. 1* Try to return to Act 1 of Aquarium Park. 2* (will update later) 3* Try to use lazer, high in the "sky." 4* (will update later) 5* Use lazer against the blocks. This level is made almost entirely out of bomb blocks and platform blocks. The main key of this act is to follow the yellow triple-spring and bounce your way to a group of rainbow rings that send Sonic flying downward and through another piece, from Act 3. During the final area of the stage, another set of springs moves upward while a pattern of energy shots slowly falls down from above. Sonic must dodge the energy shots and avoid being injured by the bomb blocks to proceed to the goal. The final Aquarium Park act starts Sonic where the alien capsule used to be (a little). He travels through the water and a school of fish can help him keep oxygen and protect against damage for a limited amount of time. After traveling through the water, it switchs to 3D and you reach the very first checkpoint. The path seems okay until the triangle cauion symbol appears, warning you of a waterfall ahead. Jump over it (or double-jump over it) and you should reach the other side. Lobsters and Egg-Samurai should be in the area in front of you know. Defeat them; continue to the inside of a building and reach the second checkpoint. Defeat the next robots using Hover and you have a two-path divide to either the area ahead (using the White Wisps) or the path of rings (using the Green Wisp). Both sides end with a spring that bounces Sonic upward and fly down to the ground. After the next checkpoint, he must defeat a room of robots to unlock the next door and final checkpoint. When you go underwater, you see a sea creature that seems to attack Sonic. You can choose to be near the rock floor or find the Yellow wisp and use Teropedo to swim to the goal. This page was last edited on 6 March 2018, at 07:53.